Made with a perfect blend of gluten-free flours and starches, Bob's Red Mill Gluten Free Vanilla Cake Mix can be easily transformed into your favorite cake or cupcake recipes that call for a white cake, or simply bake as directed for a delicate vanilla cake. 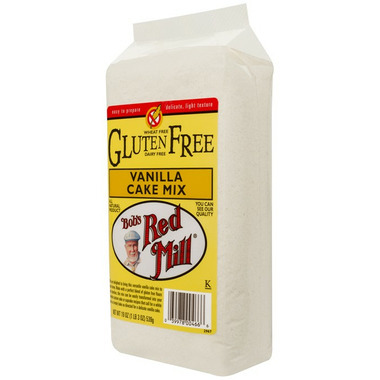 Bob's Red Mill Gluten Free Vanilla Cake Mix features healthy, whole grain sorghum flour. Sorghum flour is a powerhouse of nutrition and adds a superb flavor to gluten-free baking. We are fans of this brand - but this particular mix is not their best work. I used this for the first time last week for a family gathering and it was a complete success. I put a bit of walnuts, coconut and brown sugar on top before it went into the oven. All the comments I got were how tasty it was and I was asked for seconds. I will definitely be buying this again! By the way, no one realized that this was gluten free. I made these as cupcakes and they were pretty good. My family liked them because we're used to gluten free, but others didn't enjoy them as much.